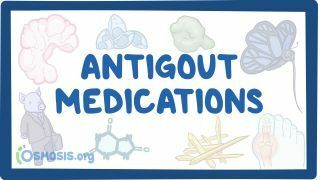 Osmosis: Antigout medications. (2019, April 24). Retrieved from (https://www.osmosis.org/learn/Antigout_medications). Allopurinol (trade name Zyloprim) is a medication used primarily to treat excess uric acid in the blood and its complications, including chronic gout. It is a xanthine oxidase inhibitor which is administered orally. Febuxostat (trade names Adenuric in Europe and New Zealand, Uloric in the US) is a drug that inhibits xanthine oxidase, thus reducing production of uric acid in the body. It is used in the treatment of chronic gout and hyperuricemia. Pegloticase (trade name Krystexxa, formerly Puricase) is a drug for the treatment of severe, treatment-refractory, chronic gout. Colchicine is a medication most commonly used to treat gout. It inhibits microtubule polymerization by binding to tubulin, one of the main constituents of microtubules. Availability of tubulin is essential to mitosis, so colchicine effectively functions as a "mitotic poison" or spindle poison. Probenecid (trade name Probalan) is a medication that increases uric acid excretion in the urine. It is primarily used in treating gout and hyperuricemia. Colchicine is able to bind tubulin which prevents microtubule formation, thus blocking . A 52-year-old female presents acutely with podagra and is prescribed indomethacin. Several weeks later, her physician plans to prescribe her a xanthine oxidase inhibitor to help prevent future exacerbations. Which of the following would most likely increase the risk of this patient developing an adverse cutaneous reaction to this new drug?